Universal's singular endeavour is to prepare children that are creative, confident & articulate – children that are prepared to meet the challenges of the world's best colleges and universities. Our goal is to prepare and inspire our learners for a positive future. We know that, as parents, you care about your child more than anyone, but we believe we come in a close second. Learning at Universal is fun; it is about spirited laughter, genuine smiles and curious minds. Thanks to our dynamic curriculum, a rich co-curricular programme and resilience-building student care programme – learning at Universal extends well beyond the classroom. At Universal, no two days are ever same – nor are two learners' experiences exactly identical. Universal offers a post-modern, robust, green and safe environment for your child. Comfortable spacious classrooms, wide staircases & corridors, an eLibrary burgeoning with books, well-equipped modern science labs and a distinctive play area make our fully air-conditioned building a true temple of learning. Universal is an all-Apple 1:1 school with an age-appropriate Apple computer (iPod/iPad/Macbook) for each learner. Our relationship with technology powerhouses such as Apple, Google & Espresso allow us to make technology a way of life at Universal. Individualised Learning: Small class sizes, a teacher:student ratio of 1:15 & the creation of an Individual Learning Plan (ILP) means every learner gets much personal attention from their teachers. Specialist experts work with learners individually & provide them with academic, artistic & athletic opportunities. At Universal, our teachers go beyond just teaching the mind. They model and inculcate values like respect, responsibility, integrity, and service. Universal's qualified and dedicated teaching staff are assisted by caring and qualified support staff. We strongly believe that all students can learn. As a result of this fundamental belief, we embrace the high accountability levels to which we are held by our parents and learners and we set our expectations high. Thus driven by high expectations and accountability, our results speak for themselves. 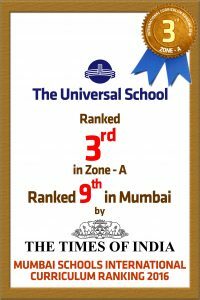 We are ranked 3rd in Zone A and are the 9th best school in Mumbai. Recognised for its dedication to academic rigour and for its vigorous activity programmes in sports, arts & cultural learning, Universal thrives on its culturally diverse international community & offers classes from pre-school to secondary school. All these are provided in a nurturing educational community which values global citizenship anchored in Indian values. As a reputed chain of institutions with over 4 decades of experience & over 35,000 students, Universal truly makes a difference for every learner by bringing in professionalism and specialization in everything – from teacher training to curriculum development, from admissions to technology, from learner well-being to infrastructure development. And everything else in between.